Overly detailed biography of the critically esteemed author limns every up and down in his self-destructive life. 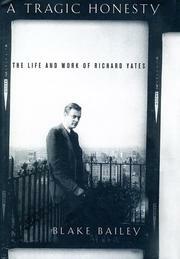 Mind you, there’s no way to write about Richard Yates (1926–92) without spending a lot of time describing alcoholic seizures, nervous breakdowns, and ghastly coughing fits resulting from lung damage sustained during WWII and exacerbated by heavy smoking. The son of ill-matched parents who split when he was three, Yates hardly ever saw his father after the divorce and grew up to despise his feckless, alcoholic mother. Yates seems never to have recovered from his dreadful childhood, and although his early short stories won him a devoted literary agent (Monica McCall) and some magazine sales, their bleak point of view was already prompting the uneasy reactions that would always limit his commercial success, though fellow writers were—and continue to be—awed by the elegance, economy, and bitter honesty of his prose. Revolutionary Road, nominated for a National Book Award in 1961, cemented his reputation as a painfully acute observer of the discontents of the American middle class, but it took him eight years to write its flawed successor, A Special Providence, and his personal demons increasingly dominated his life. Although he recovered his artistic equilibrium in the’70s with Disturbing the Peace and The Easter Parade, Yates was almost always broke and lived in horrifying squalor. A shuffling, shabby, prematurely old man, he died at 66 when his abused body failed to recover from minor surgery. Bailey (The Sixties, not reviewed) tells this heartbreaking story adequately, writing smoothly about Yates’s two failed marriages, his devotion to his three daughters, his friendships with various literary figures (Seymour Lawrence and Andre Dubus among them), his influence on his creative-writing students as an exemplar of the committed artist. But though he spends many pages quibbling with bad reviews, the biographer doesn’t really convey the qualities that make Yates’s work so distinctive. And without that mitigating achievement, this author’s life, retold at excruciating length, seems merely a sad, sordid waste.